The way I tend to talk about comics might make me sound like a rabid lifelong fan who knows the medium inside out. Truth is, and I didn't fully realize this myself until I started writing about them, I haven't really read that many comics. In college I was neck-deep in them; before and after, I was limited by availability and not knowing what I liked. I also noticed, in review, that from what I have read, a lot weren't that good. Some were terrible, and some just never affected me that much. 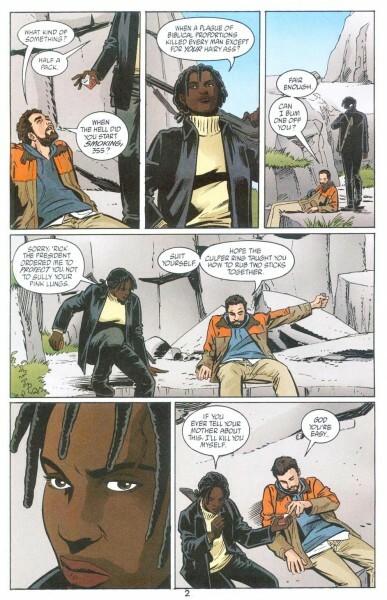 I don’t have any complaints about the art in this miniseries, or the way the story was adapted to the medium, but most of its power still comes from the story rather than anything new. I’m picky about adaptations, though, and I think it’s worth recognizing a good one. This isn’t a merchandising ploy; it’s an opportunity to bring some amazing visuals to life in a format that you can linger over and reread and lose yourself inside. Okay, here it is: the first comic I ever read. Not literally ever, but if we go back to the point where I began turning into the comic-loving nerd you know today...yep. 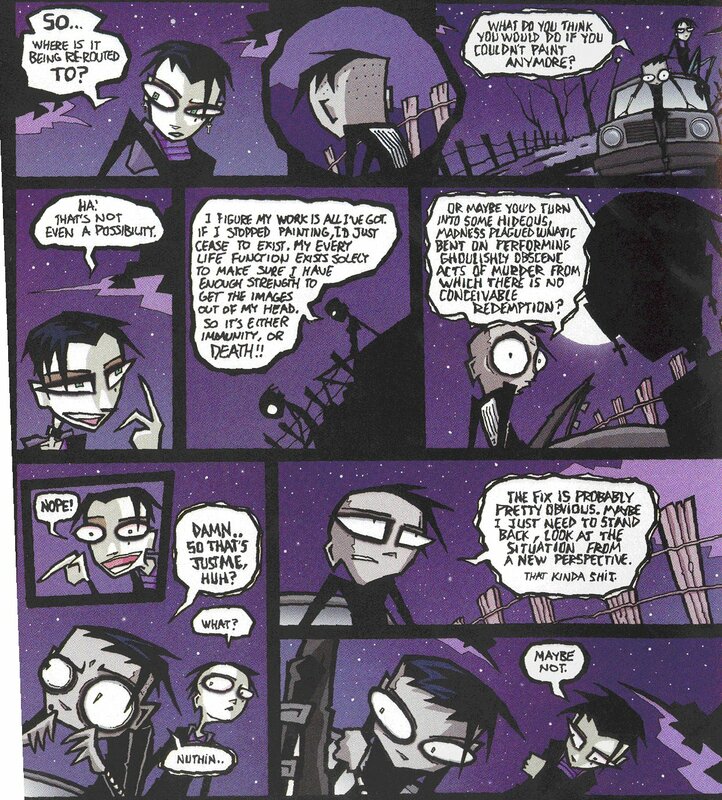 Two issues of an indie published horror/dark comedy spinoff of a cult series called Johnny the Homicidal Maniac (not featured on my list; it’s not as good). Long before I’d ever heard of Buffyspeak, my friends and I were quoting “Talk to Spooky!” and “The Beast What Licked Me” at each other. Nostalgia aside, it had a few thoughts about art that I came to value, and a really weird unique kind of friendship between the two main characters, both female, that counterbalanced the cynicism and profanity. Out of print and I haven’t read it in ages, or I’d be better able to describe how unexpected and gripping and utterly hilarious it is, and all in a neatly self-contained single volume. I still sometimes have the urge to point to a cat and say, “HELLCAT’S REVENGE!” even though I know nobody will get it and the cat won’t transform. I mean, probably. I mean, it’s still worth it to keep trying, right? 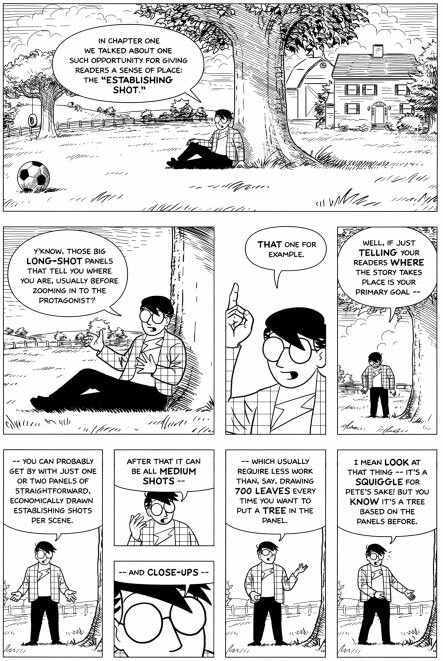 My favorite of Scott McCloud’s nonfiction, because in addition to being an enjoyable read it’s actually really useful for anyone interested in the craft. For instance, there’s a double-page spread of simplified facial expressions, including “equations” that show which emotions they combine. There’s one little panel that demonstrates all the different ways there are to draw a beautiful woman, so your female characters don’t all look alike. I only wish I was actively producing comics right now, but if I was/when I do, I would/will lean on this book a lot. Only available online for now, and unfinished. I started reading for the art (all wolves all the time and damn they’re drawn beautifully), but eventually got caught up in the story as well. It’s surprisingly mature and inventive, without the self-indulgence common to a lot of amateur furry/fantasy art. 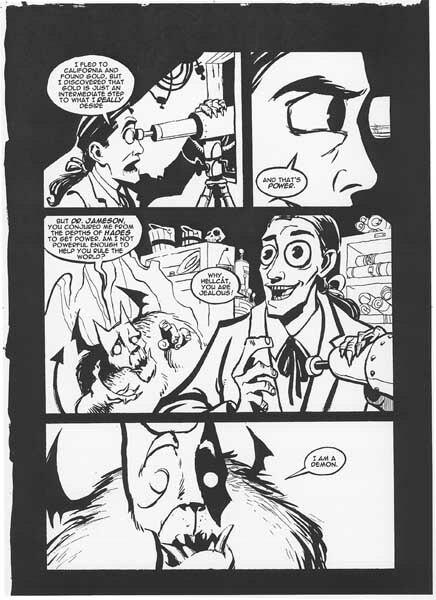 If you start reading now, be warned that there will be a sharp drop in quality somewhere in the middle, as the artists have been working on it for a long time and are currently in the process of redrawing the early pages to level out the standards of the series. The Marvel Comics of today seems to have a hard time coming up with new series or characters that stay true to its roots. Squirrel Girl is their ultimate success story, representing the modern world in slang, culture, and values while remaining upbeat and action-packed. The humor is constant and relevant, but more importantly, it’s kind. 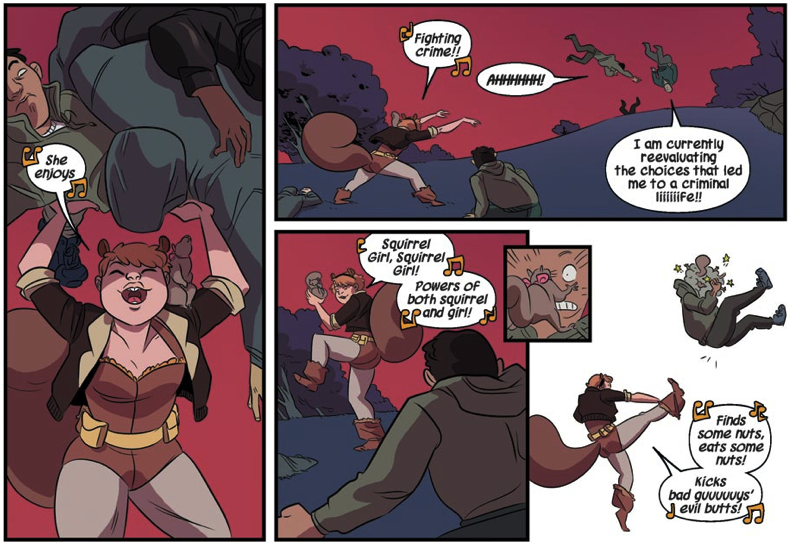 Squirrel Girl isn’t morally grey and she never suffers a humiliating defeat -- she’s a true hero who knows she’s awesome and makes sure the reader is always having as much fun as she is. One thing about becoming interested in comics as an adult is that you most likely enter through the side door: Watchmen was written as a response to superhero comics, and makes a stark contrast to the innocence of juvenile fiction, but I hadn’t grown up with superheroes and couldn’t see the contrast. All I knew was that it was considered a must-read graphic novel, so I bought it and read it during a lonely period of upheaval in my life. A few weeks later, planes crashed into the World Trade Center. 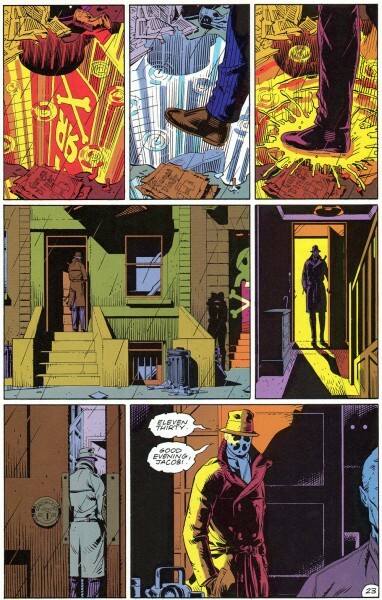 To me, Watchmen still feels a little bit like reality. If you actually deconstruct this series and examine how intricately the plot was woven together, the only word for it is breathtaking, but as always, I’m here for characterization and worldbuilding and quotability, not for the plot. Y has everything. It’s easy to focus on the premise -- “What if all the men in the world, except for one, suddenly died?” -- and its execution, but I’d say there’s a lot more going on here than gender questions. It’s a story with a huge scope that still manages to keep the emotional details in the center, and the art is always in perfect harmony. 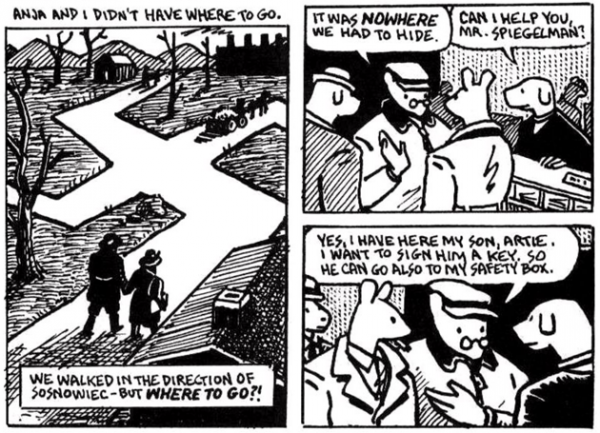 I'm intimidated to even talk about this one because it’s freaking Maus, what the heck can I say as an average comic fan making a list of comics? You’re much more likely to see it in lists of must-read biographies or WWII literature, but the truth is on the page: it fits every definition of a comic. (It also fits my definition of ‘furry’ from a previous meme entry. Yes, we can ignore this.) Maybe it hasn’t single-handedly validated the medium, but read it and you’ll see that there was no other way to get the message through so vividly and completely. You’ve probably already read it, though. Good. No, not the ones that came later to clean up the format and enforce a higher standard of art and writing. Not Angel and Faith, not Season 10. 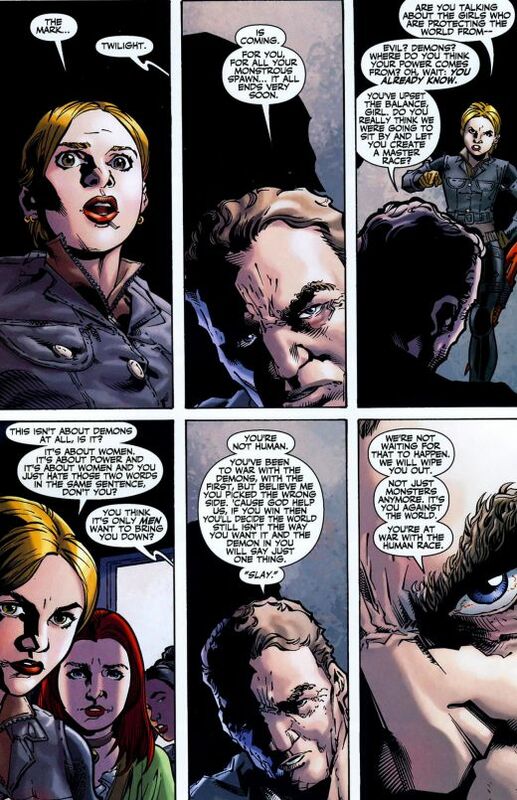 I’m talking about the original canon comic continuation of Buffy, the one that we all got into mad raving online fights over, the one that wouldn’t rest until it had pissed off every individual in the fanbase, the one that signed canon’s death warrant with its terrible character choices amid flashes of glory. Why is this still my favorite? I just told you. 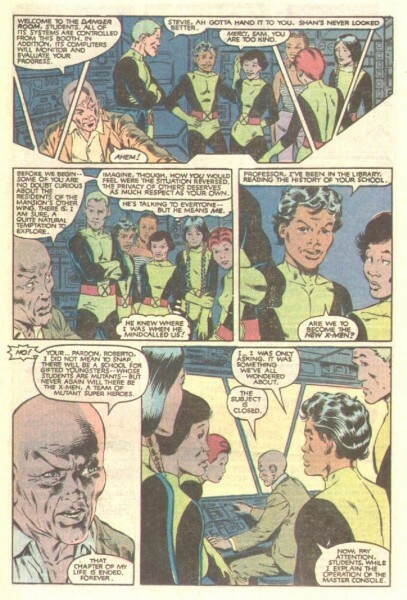 With Watchmen under my belt I decided to finally go mainstream, and the series that interested me most starred Marvel’s mutant misfits -- this may have something to do with the paucity of superhero films at the time, limiting my exposure and therefore curiosity, but to this day, nothing has ever hit me like X-Men did. 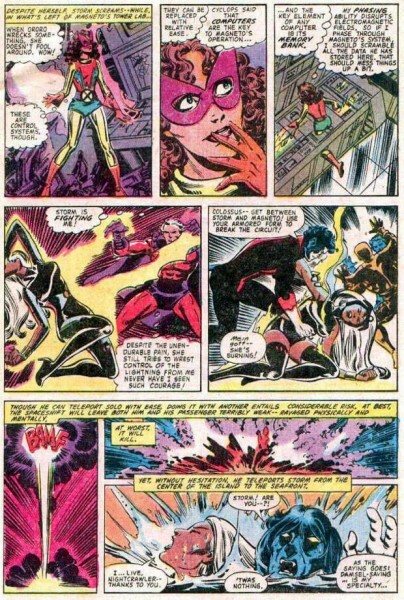 The reason I keep mentioning the chronological order of how I read these comics is that they formed a path and it led here, just as classic superheroes led to superhero commentary led to horror led to indy published dark comedy, but in reverse. 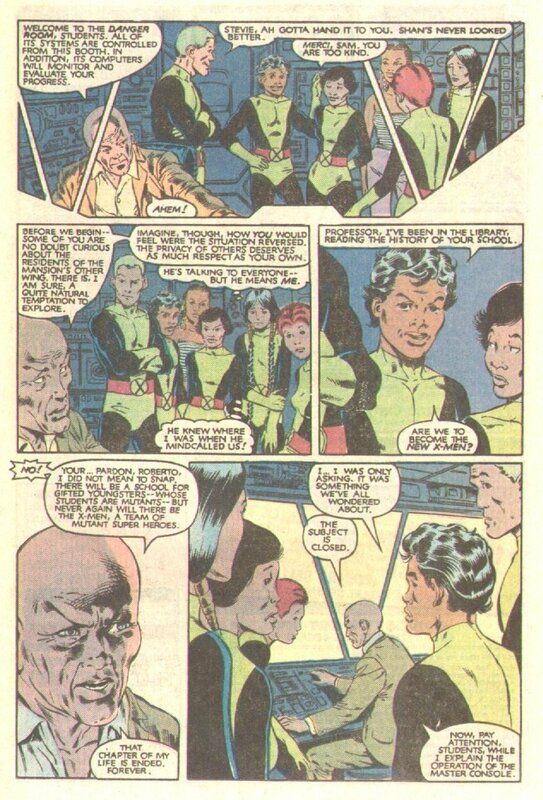 A part of myself was unlocked when I first met the X-Men, and everything I ever write will be influenced by it in some small way. 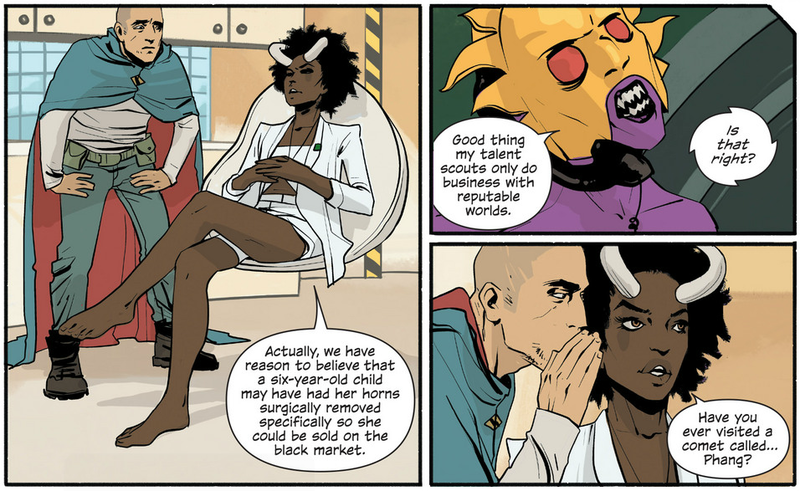 With most of my favorite works I can identify something they incorporate, aside from quality, that hits a sweet spot for me that other people might not have, but Saga is just good. 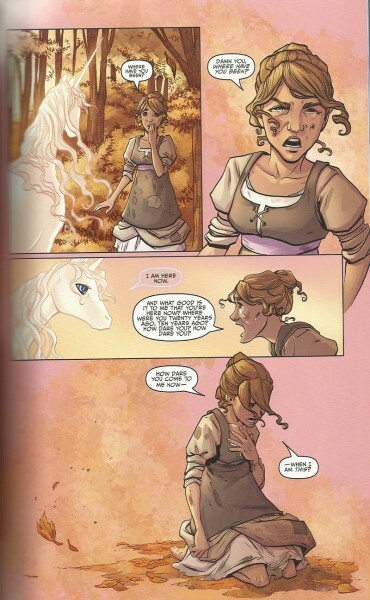 The story is thrilling, the characters are fascinating, the setting is epic, the art is spectacular...I can see it being too weird for some, or crossing a personal threshold of obscenity, but if anyone tries to call it patchy or shallow or trite, you'll know that person isn't trustworthy. Okay, maybe it does hit some sweet spots. Animal sidekicks, magic in space, winged humanoids...but honestly, who doesn’t like that stuff? The second comic of my personal history (in between I Feel Sick and Watchmen) is also a life-changer, so please use carefully. Panels of it are burned permanently into my mind: a woman trying to remove a mask when her hands are full of the last two masks she removed; a candle extinguished after reality itself is defined; chocolate people filled with raspberry cream. I had merchandise, I drew fan art, I cosplayed, but the only thing that really mattered was that it made me feel so much just by reading, just by its varied art and mythology and history and questions and quotes and hell, its freaking speech balloons. And then...and then I...and then I woke...and then I woke up. Haha you're all thinking I can't really love X-Men that much if I put it fourth on my list but I got you good, bro. X-Men is just a blanket title for all Marvel's series starring mutant groups, and Uncanny X-Men is the mainstay, but New Mutants was the first spin-off, and it's better. It's better because it's teenagers who act like teenagers, because they're good people except possibly for Ilyana who is three-fifths evil (not her fault), because character diversity is real and not just cosmetic, and because there's proportionally more of the good stuff before it degrades into the 90's Marvel mess. There was a time that comics were just about telling fun, exciting, emotional stories. That time is over, but this is the best archive I've found.